PettiBear's Fashion Roar: In the Air....Spring that is! 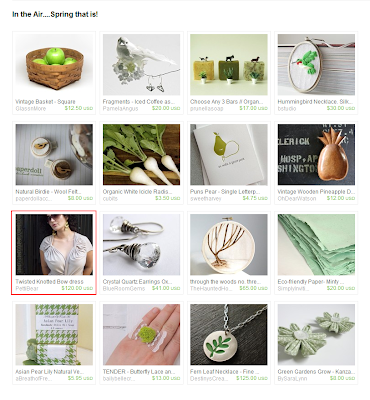 Check out my Twisted Knotted Bow Dress in this lovely spring smelling treasury created by craftedbylindy. Well,without spending to many words admiring the little squares above, lets check what craftedbylindy has to offer us...You'll LOVE her modern cute little paper goods!!!! I'm a wife, stay-at-home mom and Etsy shop owner from Calgary Alberta. My education is in Fine Arts, specifically Technical Theatre which actually lead me to volunteer management which I'd been doing up until we had our son 3 years ago. I have many obsessions which include photography, architecture, design, event planning, and most noticeably paper! I've recently become quite addicted to blogging. I write on two of my own blogs as well as contribute to two others. I'm a proud member of the Etsy Alberta Street Team which I'm also the administrator for. I love creating and nothing beats the rush of discovering something new or having a project turn out exactly how it's pictured in my head. I've been obsessed with paper for a number of years. When I made the decision to stay at home with my son full time I decided I needed something for me. I've been making cards and stationary for a number of years so I quickly started working on some images and opened my Etsy shop in February of 2009. I didn't realized how much my shop would feel like work, how many great people I would meet and how much I would love it! It's been a fantastic experience. Welcome to my paper obsession. Nice to meet you Lindy!! !